A few years ago, some security minded people and academics started looking into BlueTooth (BT) sniffing. Commercial solutions were expensive, and the community really needed something cheap/affordable. The names: Dominic Spill & Andrea Bittau, I think were the pioneers that discovered that some cheap $30(USD) BT dongles could be re-flashed to a firmware that supported BT sniffing, and they created the Open-Source program csrsniff (http://darkircop.org/bt/bt.tgz), that allowed you to monitor the BT stream between devices. They may no longer work for no apparent reason. They are no longer readily available. They are incompatible with several other BT implementations/devices. Michael Ossmann and Dominic Spill (circa 2009), thought that the above mentioned solution was bad, and that the community needed something more appropriate. They then went about creating a truly Open-Source hardware and software solution for BT sniffing called the Ubertooth. To this day the Ubertooth is still quite rare, slightly more expensive at approximately $110(USD), but still remarkably cheaper than the $2000+(USD) commercial counter parts. 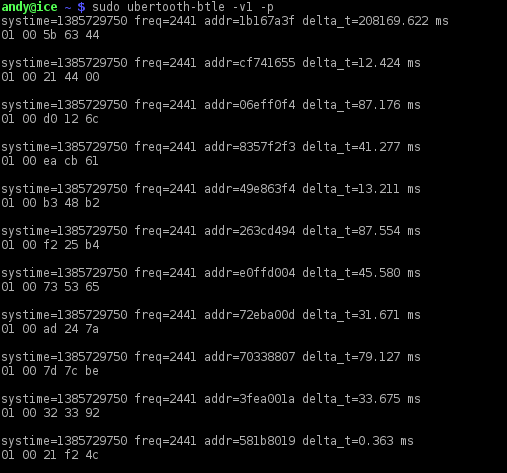 In this post we will cover using the Ubertooth to perform BT sniffing. The following github installation was done on a Gentoo Operating System, differences for Kali and Ubuntu can be found under Notes in the relevant sections. Additionally, prior to compiling libbtbb, you need to ensure that pyusb and pyside-tools are installed on your system. If you have similar output to above, be assured that your device is working properly. This allows you to identify devices in hidden-mode/non-discoverable mode. You need an additional hciXinterface, as the Ubertooth is not a fully fledged BT dongle – just a sniffer; Here the Ubertooth grabs LAP & UAP to form addresses, and hands off inquiry to a proper BT dongle. Unfortunately, I have not found any personal devices that appear to track. I believe the disadvantage here is that the Ubertooth can not follow High-Speed devices. Most of my personal Bluetooth devices are High-Speed and hence I am not capturing any data packets. As soon as I can create a demo / working example I will repost here! 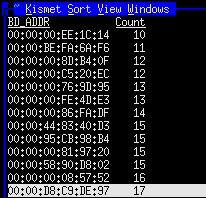 Warning: You will see a lot of garbage, but eventually it should lock-on and automatically follow streams, you should then see data packets (packets that do not start 01 00). 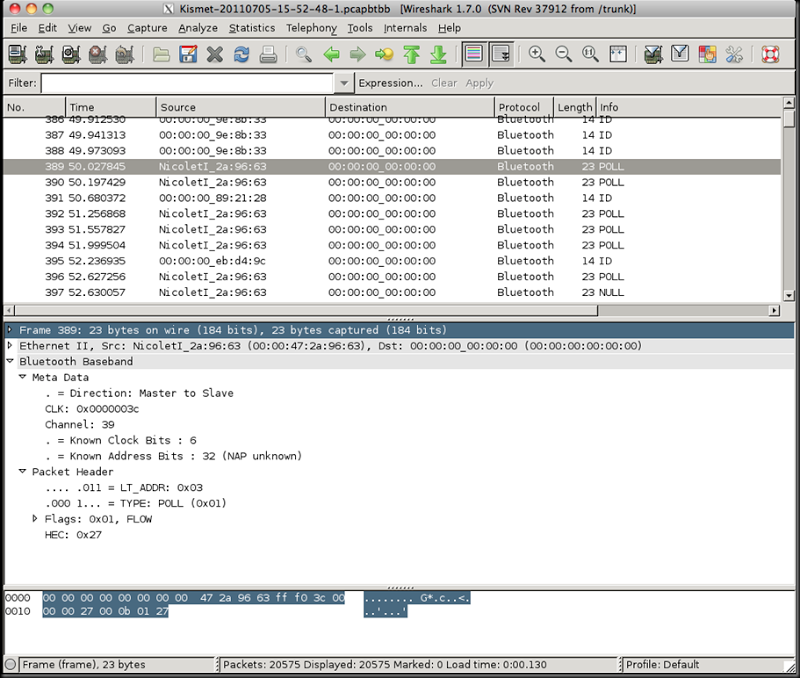 As you can see from the picture above, some devices are just revealing their LAP (Lower Address Part) while other devise have had enough packets captured to additionally display their UAP (Upper Address Part). Check the pcapbtbb logfile for potential data. Additionally, you do not really need the first two bytes to interrogate devices; so with the UAP & LAP you can use other tools such as sdptool and rfcommto talk to devices. Where Can I Purchase an Ubertooth?